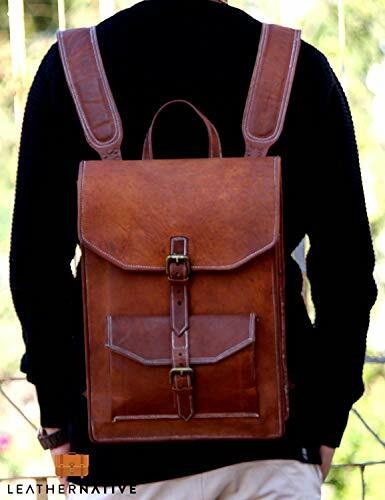 Leather Native 15" Brown Vintage Leather Backpack Laptop Messenger Bag Rucksack Sling for Men Man Women Summer Sale! Discover The Stylish Solution To Your Laptop-Carrying Needs! Are you searching for a supreme quality, designer backpack that can endure the wear and tear of your college or professional life? Have you had enough of those fake leather and poor quality messenger bags that don't even have enough storage room for your personal items? Try a Leather Native bag and you will never look back! Designed with high-end goat leather material and featuring a fashionable and durable frame, our vintage backpack will become your essential companion in your day-to-day life. It may not be the biggest or bulkiest backpack in the world, but itfeatures more than enough space for your laptop, MacBook or notebook. Plus, its elegant design and compact, lightweight frame make it perfect for men and women of all ages. Designed with a total of 3 interior compartments, our leather briefcase also features 2 pockets on the front side and an extra pocket on both sides of the bag, allowing you to carry your laptop as well as a plethora of personal items such as your smartphone, tablet, papers, documents, CDs and much more! Enjoy comfort and practicality without sacrificing your flawless style in the process! The quality of our bag improves with time as the leather softens and its color deepens. In fact, we have utilized special natural oils and light application to encourage an artistic tone and blending of browns, which also makes the bag more water-resistant. Scroll Up, Click 'Add To Cart' And Carry Your Laptop Around With Style!